The Sixth Session of Qatari-German Joint Commission on Economic, Trade and Technical cooperation began in Berlin to discuss the development and promotion of bilateral economic and trade relations. The session was co-chaired by H E Ali bin Ahmed Al Kuwari, Minister of Commerce and Industry, and Thomas Bareiß, Germany’s Parliamentary State Secretary at the Federal Ministry for Economic Affairs and Energy. In his opening speech, H E Al Kuwari hailed the close relations between Qatar and Germany, noting that bilateral ties have gained momentum following the historic visit of Amir H H Sheikh Tamim bin Hamad Al Thani to Germany last September, during which H H the Amir announced Qatar’s intention to invest €10bn to support the German economy over the next five years. Several important agreements were signed during the session, including one relating to the establishment of the Qatari-German Businessmen Council, which will play a key role in bolstering joint efforts to develop strategic bilateral cooperation. H E Al Kuwari highlighted Qatar’s successful participation in the Hannover International Trade Fair marked a new milestone in the historic journey of Qatari-German partnerships. The Minister noted that Qatar and Germany enjoy close political and economic ties, which have reflected positively on the value of bilateral trade, which reached €1.9bn in 2018, accounting for 1.8 percent of Qatar’s total foreign trade. H E Al Kuwari noted that over 300 German companies operating in Qatar play an important role in supporting the development of the country across vital industries including the manufacturing, services, telecommunications, transport and infrastructure sectors, among others. On the other hand, Germany represents an attractive destination for Qatari investments, which exceeded €25bn by 2018, he said. 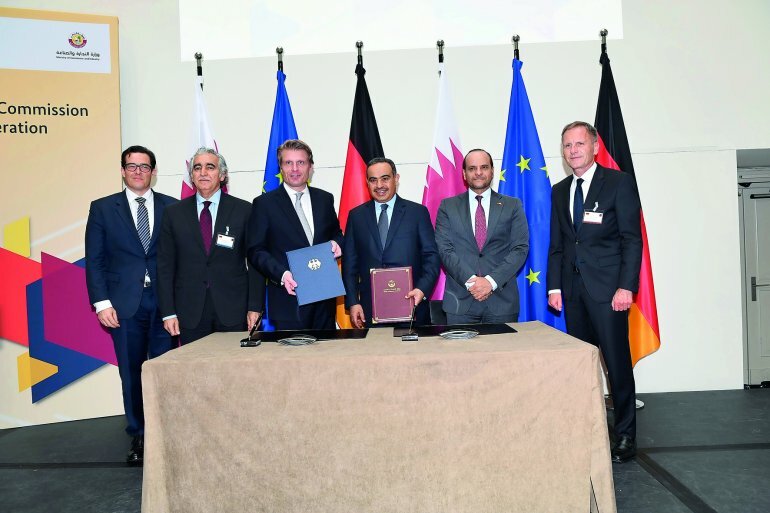 Qatar Investment Authority has provided support for various vital areas of the German economy, including the automotive, telecommunications, hospitality, and banking sectors, among other industries. H E Al Kuwari outlined the economic policies that Qatar has embraced over the years to accomplish its National Vision 2030. He said Qatar has adopted integrated strategies to diversify its economy while encouraging the private sector to invest in non-oil activities and sectors such as renewable energy, technology, small and medium-sized industries and infrastructure. Qatar has also sought to attract foreign direct investments and promote the localization of industries to achieve self-sufficiency and strengthen its economy, H E Al Kuwari said. German companies that choose to set up shop in Qatar will find a multitude of investment opportunities to tap, H E Al Kuwari said, referring to development projects being undertaken within the framework of the Qatar National Vision 2030 and ahead of preparations to host the 2022 FIFA World Cup. The Minister noted that Qatar’s foreign trade also witnessed remarkable growth in 2018 as exports increased by 25 percent, while the trade balance hit a surplus of €46.6bn, an increase of 40 percent compared to 2017. H E Al Kuwari underscored the importance of pursuing efforts to increase the number of direct flights between Qatar and Germany. In his concluding remarks, H E Al Kuwari voiced hope that the Sixth Session will result in fruitful outcomes in the best interest of both countries. For his part, Thomas Bareiß said the joint economic commission is the premier focal point where representatives of government as well as of business meet. “The German-Qatari economic relations are excellent but there is still room for further deepening. Germany looks forward to fully contribute with its excellent product and services to the diverse economy of Qatar while at the same time inviting Qatar to the strongest economy of the European Union,” he added. During the meeting, both sides welcomed the impetus that had been brought to Qatari-German relations through the visit of H H the Amir of Qatar to Berlin last September. Officials discussed the promotion of bilateral cooperation in the energy, industry, agriculture, transportation, health, education, sports, technology and cultural fields. Both sides agreed to expand bilateral trade relations through the development of long-term partnerships, while welcoming initiatives undertaken by the private sectors in both countries to strengthen bilateral economic cooperation mechanisms. Officials also stressed the importance of bilateral investments and their contribution to sustainable economic development. The two sides agreed to take the necessary steps to advance trade and investment cooperation in a bid to increase bilateral trade and facilitate the flow of goods, services and investments between the two countries. Both sides agreed to hold the Seventh Session of the Qatari-German Joint Commission in Doha during a date to be mutually agreed. Both sides also welcomed the development of communication channels to develop the education sector in both countries, particularly in relation to technology and vocational education. Both sides also encouraged participation in education fairs, exhibitions and conferences relating to higher education, scientific research and technology. Sheikh Nawaf bin Nasser Al Thani, co-Chairman of the German-Qatari Joint Task Force for Trade and Investment, voiced hope that both sides will coordinate efforts to establish action plans to address the challenges facing businessmen in both countries. He highlighted the strength of the German economy and significant developments in the fields of scientific, research, industrial and technology. He noted that Qatar’s unique investment activities in Germany provide further incentives to strengthen investment relations and enhance communication between the business sectors in both countries. He added that the private sector is currently channeling part of the Qatari-German investments into small and medium enterprises, which represents pillars of economic development in both countries. H E the Minister of Commerce and Industry and Germany’s Parliamentary State Secretary at the Federal Ministry for Economic Affairs and Energy, co-signed the minutes of the Sixth Session. The session brought together Sheikh Khalifa bin Jassim Al Thani, Chairman of Qatar Chamber; Hassan Al Thawadi, Secretary-General of the Supreme Committee for Delivery & Legacy; Sheikh Nawaf bin Nasser Al Thani, co-Chairman of the German-Qatari Joint Task Force for Trade and Investment; and H E Sheikh Saoud bin Abdulrahman Al Thani, the Ambassador of the State of Qatar in Germany, along with a number of senior officials, businessmen, decision-makers and investors from both countries.